Sonal and her team did such a great job with our wedding. She helped us in all aspects of our planning and coordinating process. Sonal expertly guided us through the wedding business. From venue negotiations, to caterers, and the music – it was clear to us that Sonal knew the ins and outs of the wedding scene. 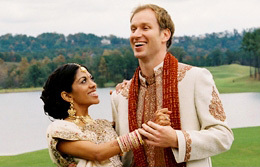 Sonal’s organization was especially important during our chaotic Indian Wedding – from seating, to timing, to transportation. Sonal’s advice was invaluable, she helped shape our ideas about the wedding format, and the precise flow of events. Even when there was hiccups along the way, she never left our side and continued to help us after the wedding had ended, which showed us how committed she is to being there for her clients. Her whole team was very patient, courteous, considerate, caring and calm, which was very much appreciated by our whole family. We felt like Sonal and her team became a part of our wedding, and thanks to their help, it was the amazing experience. We want to thank her and her staff for all of their efforts during the most momentous time in our lives.